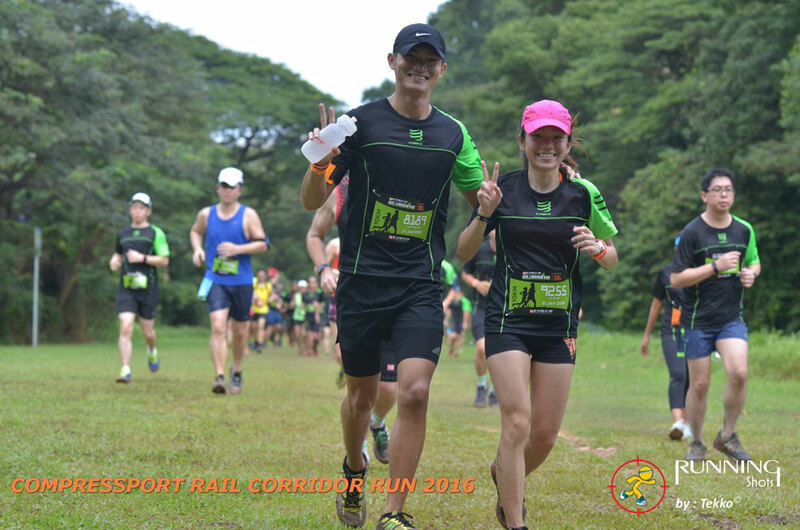 Race Review: Compressport Rail Corridor Run 2016 (By 'Run Your Pace') | JustRunLah! 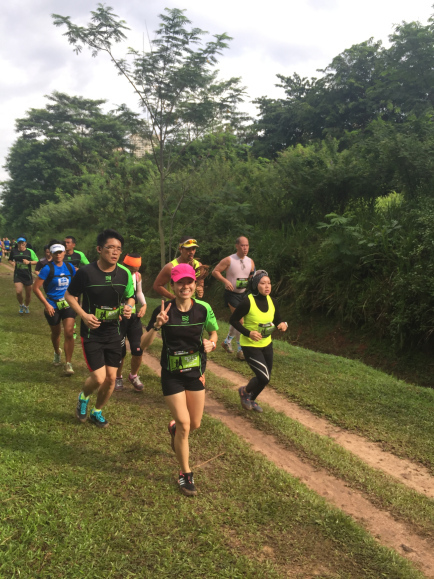 The Compressport Rail Corridor run 2016 was our first ever trail running experience. 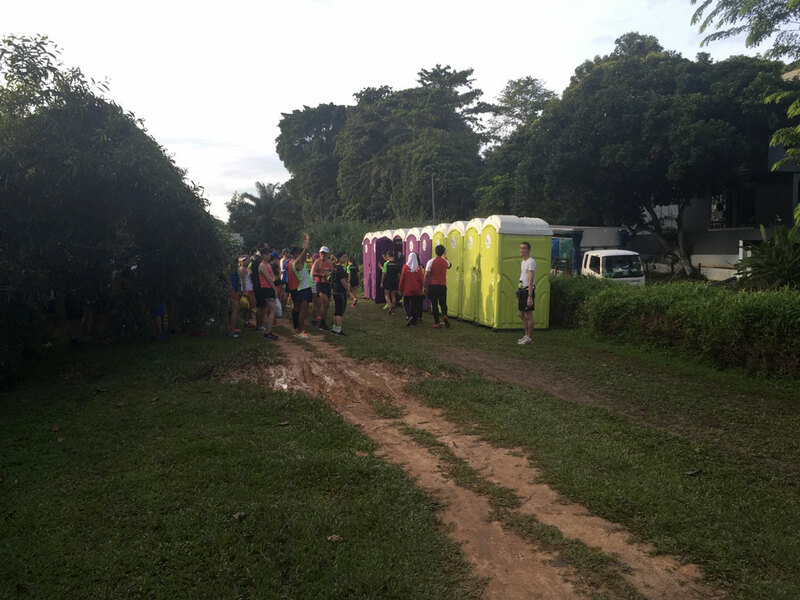 We were so fortunate to have gotten 2 free race slots from our generous friends at Gatorade Singapore, who were the official hydration sponsor for the event. The race was held on the 31st January with 2 categories – 10km and 5km. 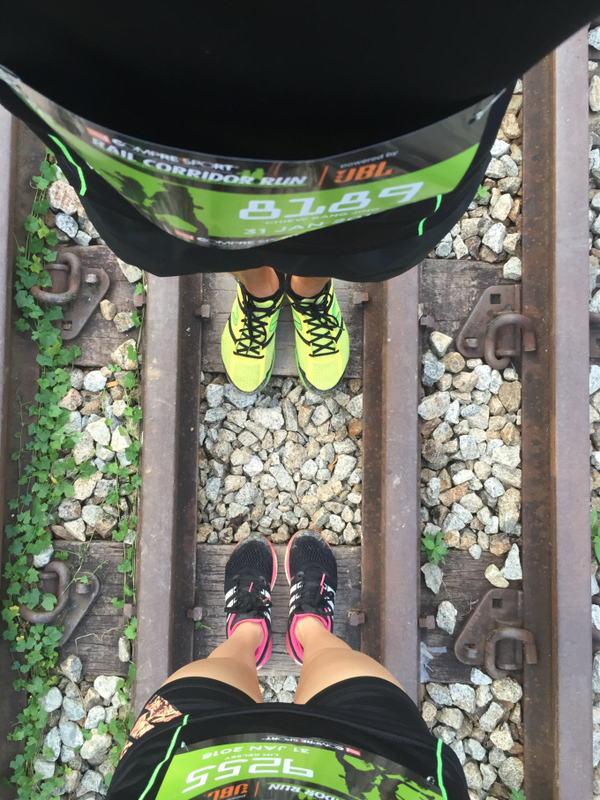 Feeling adventurous and all eager to explore the new route, we chose to run the 10km category which stretched from Bukit Timah railway station to Tanjong Pagar railway station. The flag off time for the 10km category was at 9am, the latest flag off timing for a 10 km morning race we ever went to. However, no complaints from us because this meant that we would be able to get more sleep and travel there via public transport instead of spending money on a cab 🙂 We took a 10 min bus ride at around 7.15am, alighting at King Albert Park station. Finally it was time to flag off! We were in the 2nd wave although we went to wait at the starting pen at 8.30am (I guess there were even more kiasu people than us haha). But the intervals between each wave weren’t too long so it was alright. Just about 100m after flagging off, there was already a jam in front of us! We were wondering if there was a steep drop off ahead that was causing the jam, but as we approached it, we realised that it was a huge puddle of mud and everyone was going AROUND the puddle instead of through it, thus causing the jam. I honestly don’t recall it raining the day earlier.. In addition to the frequent puddles of mud every 50 meters or so, I found the run rather adventurous and interesting! Running on the soil and grass was actually much softer than running on the road, which is something we are both used to. 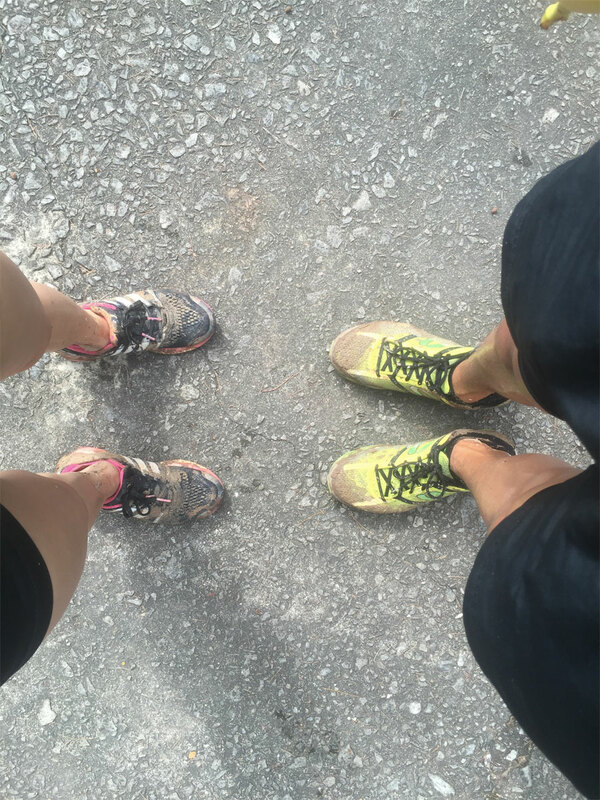 Like most runners that day, we did not buy trail running shoes. As a result, careful footing was really important as some parts of the trail were really uneven with rocks. It was also really slippery running/walking over the sticky mud. Any mistake could easily lead to a sprained ankle or worse >< . Along the route, there were several underpasses we ran under. I remember one particular underpass which was really dark and we could hardly see anything in front of us. It was so scary because there were so many rocks on the ground and I didn’t want to trip over it.. You can’t be too careful right? The 7km mark was the most memorable part of the race. As we approached it, we realised that there was a huge crowd in front of us. None of us knew what was going on up ahead that was causing this hold up, because we were unable to see anything from the back. 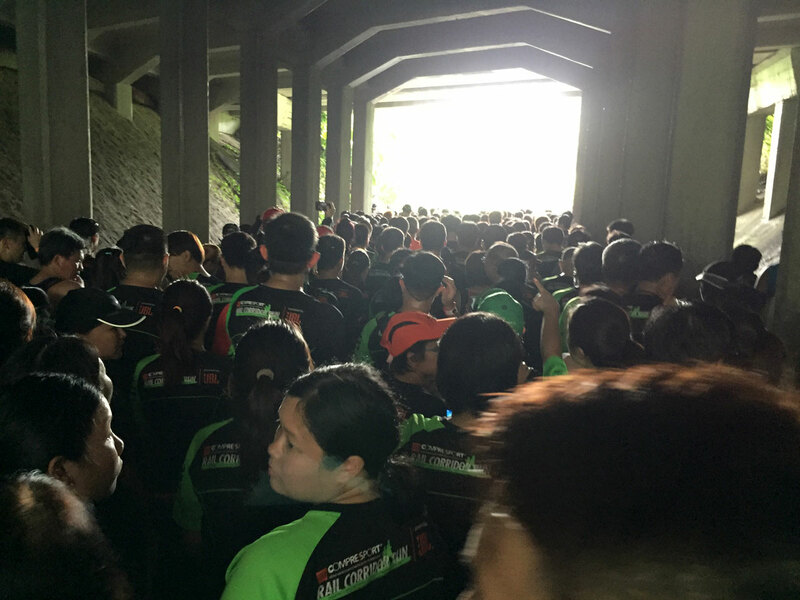 There was about a hundred people packed under this bridge and it was slowly getting stuffy and humid. Doesn’t this look like a scene from a zombie apocalypse? After about 8 minutes of jostling and squeezing with many other sweaty bodies, we were almost reaching the front of the crowd. To our left, we actually saw people climbing up a slope? What was causing the jam turned out to be a massive grey puddle which was shin deep and very murky. Some people decided not to go through the puddle so they took a detour up the hill while the rest of us decided to brave through the mud. It was taking so long because again people were walking at the edge of the puddle which was less deep than the middle. I wasn’t too afraid so decided to just step into it and thus my entire feet was submerged in the mud !! As a kid I used to love playing in mud and my sisters would say it was because my zodiac was a PIG. I guess I was in my true element then, so naturally I loved every moment of it haha. 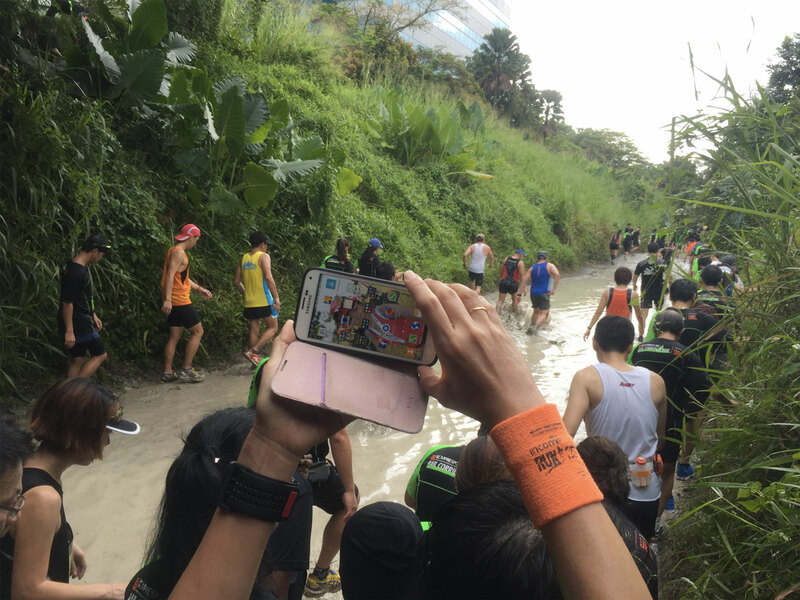 However, after passing through the “mud pond”, the icky feeling of murky water, mud and soil in our shoes was really unpleasant .. our main goal from then on was to quickly get to the finishing line and wash off!! 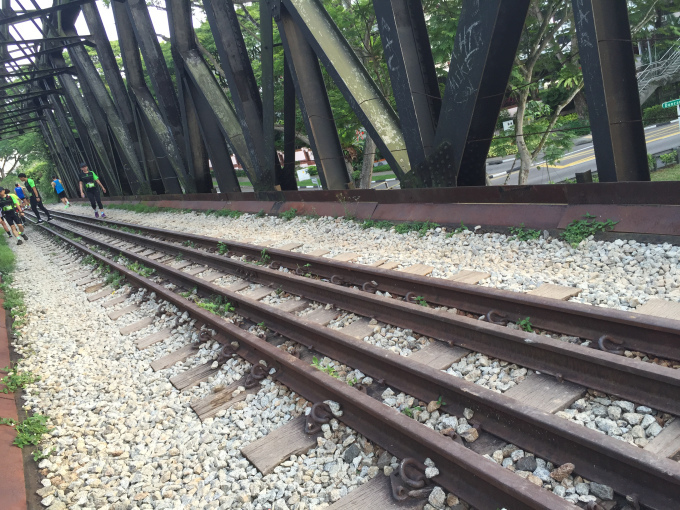 The end point was at the former Tanjong Pagar railway station. The last kilometre of the route was dry soil and grass which made running so much easier! We finished the race much longer than we would usually do. However, considering that we slowed down over every mud puddle we came across to avoid slipping and stopping at the massive jam during the run, I do suppose that it was still fairly decent. Only after the race did I realise that my legs and shoes were so dirty from the mud 😮 Luckily there was an area with hoses where participants could clean up. But of course there was a really long queue for it because many others were muddy as well. We decided to take some pictures on the tracks too! There were many other runners taking pictures there as well. 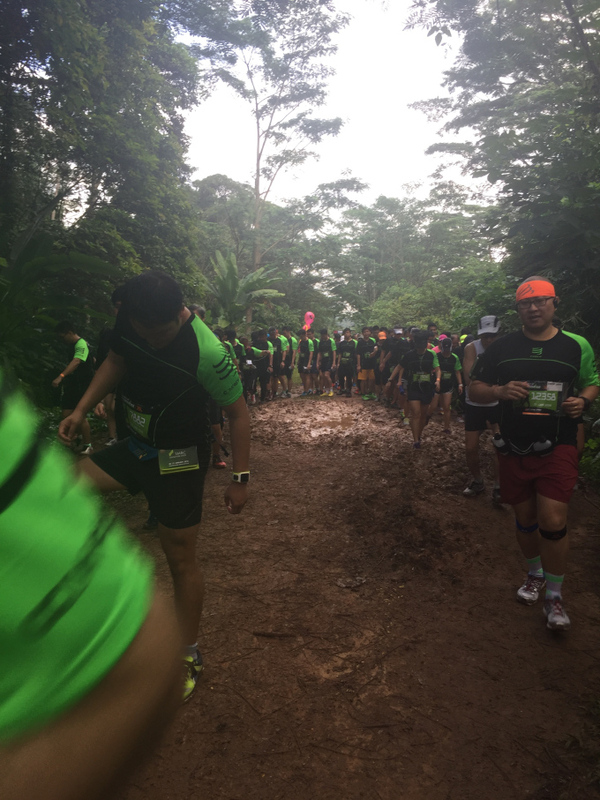 Overall, we thought that the race was an interesting first trail running experience. 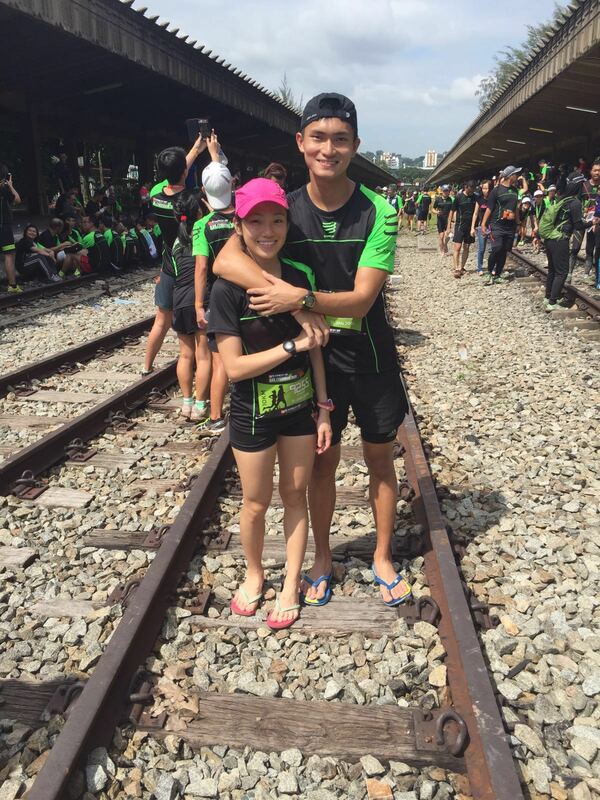 We realised that trail running was so much different from road running. In road running, we didn’t have to be so careful with stumbling over rocks or sliding over the mud for example (but of course having trail shoes would be better). Trail running heighten our senses and it forces us to pay more attention to our surroundings. It was definitely more tiring to run in the trails as compared to the road. We were glad to be given this opportunity to run along the green corridor before it will be closed for renovation some time during this year. Read more about the race and other posts on our blog www.runyourpace.wordpress.com and follow us @runningmypace on instagram! Click here for more post from Kelsey and Kang Jing.